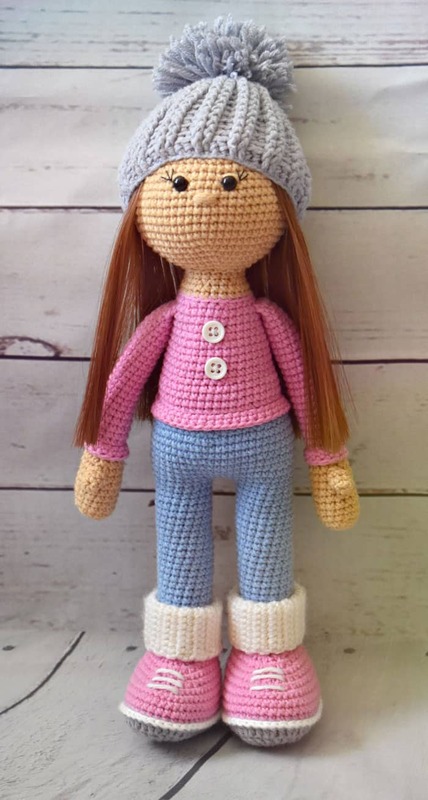 This beautiful Molly doll is an excellent gift for a girl. 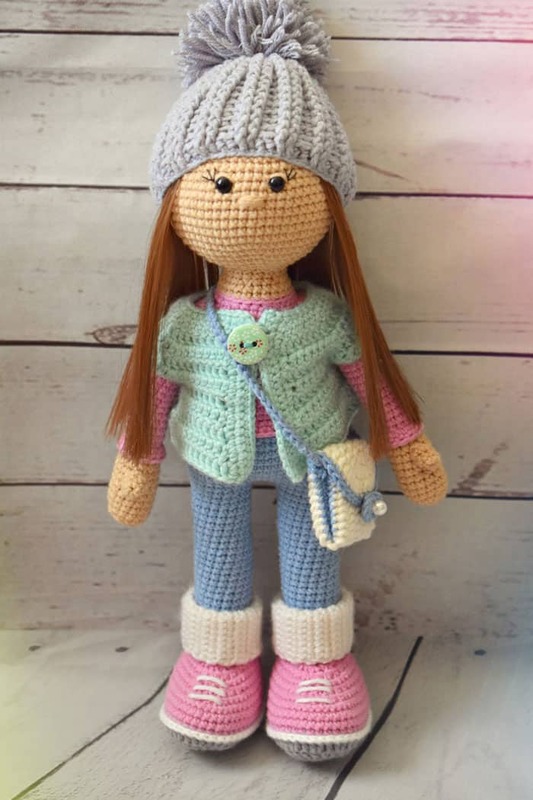 The doll crochet pattern includes the instructions for clothes and bag. Easy loops! 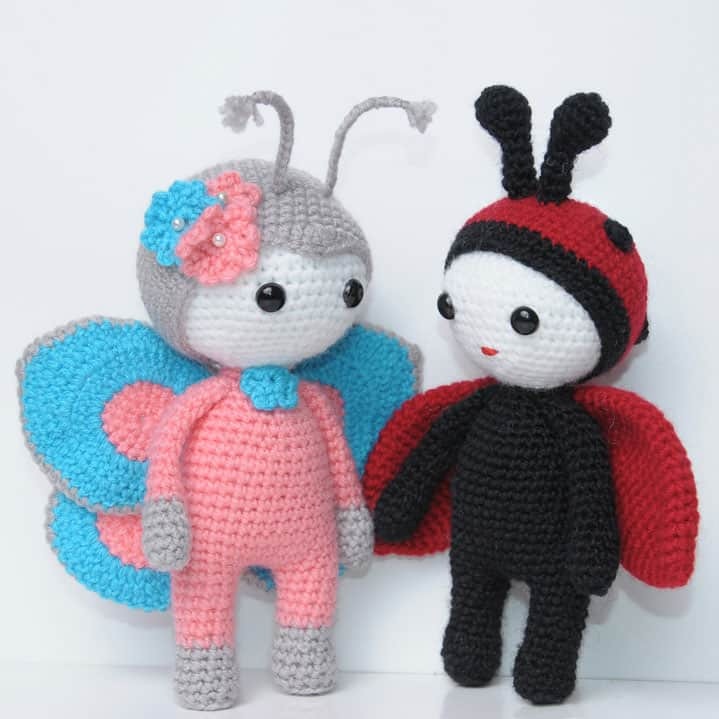 The size of finished crochet doll is about 27 cm in case of using the specified materials. Rnd 11-20: sc in all 60 st.
Insert the eyes between Rnd 17 and 18 at the distance of 6 sc from each other. Close the opening, weave in the end. Embroider eyelids, eyelashes and a nose. Rnd 1: 10 ch + 2 lifting ch. Cut the sole according to the foot. Rnd 6-8: sc in all 46 st.
Rnd 11: sc in all 36 st.
Stuff. Change to blue yarn. Rnd 15-39: sc in all 18 st.
Return to Round 5 which was crocheted in back loops. Crochet with white yarn 46 half single stitches around the foot in front loops of Round 5. Embroider shoelaces, hide the yarn. Rnd 1: 15 ch + 1 lifting ch. Rnd 2-30: sc in all 15 st. Fold, put on the leg, sew the edges together. The second part is crocheted in the same way. Join the legs with 3 ch (crochet 3 ch from one leg and join to another with sl st). Rnd 42-44: sc in all 48 st.
Rnd 46-48: sc in all 54 st.
Crochet sc till the middle of the side of the body, change to pink yarn here. Rnd 51: sc in all 42 st.
Rnd 53-55: sc in all 42 st.
Rnd 56: (dec, sc in the next 5 st) repeat 6 times  – it’s important to make the decrease first, otherwise the side of the body will be straight. Rnd 57-61: sc in all 36 st.
Rnd 63-65: sc in all 30 st.
Change to body colour yarn. Rnd 68: sc in all 24 st.
Rnd 70: sc in all 18 st.
Cut the yarn leaving a long tail for sewing. Return to Round 52 which was crocheted in back loops. Rnd 1: sc in all 42 st in front loops of the Round 52. Rnd 2: sc in all 42 st.
Rnd 4-10: sc in all 14 st.
Rnd 12: sc in all 12 st.
Rnd 13: sc in all 12 st.
Rnd 14: sc in all 12 st in back loops only. Rnd 15-35: sc in all 12 st. Fold, crochet 6 sc through both layers to close. Return to Round 14 which was crocheted in back loops. Crochet a cuff. Rnd 1: sc in all 12 st in front loops of the Round 14. Rnd 2: sc in all 12 st.
Rnd 2-3: sc in all 6 st.
Sew the finger. Crochet the second arm the same way. Sew the arms to the body. The hat was made with the help of post stitches. Please see the video-tutorial how to make them before starting. Rnd 1: 60 ch + 2 lifting ch. Close the opening, weave in the end. Give shape to the pompom and sew. Row 1: 42 ch + 2 lifting ch. Row 2: dc in the next 6 st, inc, dc in the next 6 st, inc, dc in the next 14 st, inc, dc in the next 6 st, inc, dc in the next 6 st.
Row 3: 2 lifting ch, dc in the next 6 st, inc, dc in the next 7 st, inc, dc in the next 15 st, inc, dc in the next 7 st, inc, dc in the next 7 st.
Row 4: 2 lifting ch, dc in the next 7 st, inc, dc in the next 8 st, inc, dc in the next 16 st, inc, dc in the next 8 st, inc, dc in the next 7 st.
Row 5: 2 lifting ch, dc in the next 7 st, inc, dc in the next 9 st, inc, dc in the next 17 st, inc, dc in the next 9 st, inc, dc in the next 8 st.
Row 6: 2 lifting ch, dc in the next 8 st, inc, dc in the next 10 st, inc, dc in the next 18 st, inc, dc in the next 10 st, inc, dc in the next 8 st.
Crochet along the edges of the vest 3 rows of sc. Crochet a loop for button at the left side in a suitable place. Sew the button to the right side. Rnd 1: 25 ch + 2 lifting ch. Rnd 2: dc in the next 24 st, 5 dc in one st, dc in the next 24 st, crochet around with sl st, in the place of joining with the first dc crochet 2 ch. Rnd 3: dc in the next 24 st, (inc) repeat 5 times, dc in the next 24 st, crochet around with sl st, in the place of joining with the first dc crochet 2 ch. Rnd 4: dc in the next 24 st, (dc in the next st, inc) repeat 5 times, dc in the next 24 st, crochet around with sl st, in the place of joining with the first dc change to light-blue colour and crochet around with sc. Fold and crochet across the sides from the wrong side with sl st, thus joining the sides of the bag. Join yarn at the sides and crochet along the thread with sc to make the handle. Turn wrong side in. Crochet a bow: 3 ch, 3 dc, 3 ch, sl st, 3 ch, 3 dc, 3 ch, sl st in a magic ring, draw together. Sew the bow to the bag. You can sew a bead to the bow. Sew the head to the body. Sew tresses to the head in 3 rows. Sew the hat on top. The doll is finished! Congrats! Olá, naõ consegui entender como se faz a bolsa. Beautiful pattern. Is there a pattern for the light blue dress for this doll that is on the other picture? Thanks so much for this beauty.. everything went fine with the whole doll.. The bag is the only problem.. it’s not clear enough.. please make us a favor please and explain it more clearly.. I just finished the doll & vest. I have done the vest twice, but both came out to be so much bigger for the doll. Any adjustments that you can suggest? Do you use the same yarn as for the body? round 14 of the foot (leg) reads “sc in the next ‘2’ st (dec) repeat 6 times (18)” .. well l think this must be a miss print because the stitches don’t add up right..l went and made the assumption that it meant to read as ’12’ and tried that count and it worked..you need to fix this or make a note of it somewhere..Thanks.. I’m having difficulty understanding Rnd 8 on the vest. I’m not able to get the (1dc in the next 6 sts, inc) repeat 6 times. I keep running out of stitches. How do you reinforce the neck for a wobbly head? Hi! I’m in the process of making this now. Can I share a picture with you when I am done? Thanks so much for the pattern. My granddaughter is very excited to watch me make this and is waiting anxiously for me to finish it. Did you understand how to do the purse? I’m going to try making her with Redheart Super Saver just because it’s what’s in my stash. It being a heavier yarn could anyone suggest an approximate hook size to try? I too am going to be using worsted weight 4 yarn. I plan on using 3.25mm or 3.5mm. I just finished a doll pattern using this kind of yarn and a 3.75mm hook. And I could see the stuffing through the body. So I’m going down a size. And also take acct that your doll will be much bigger if you are using thicker yarn and a bigger hook. Possibly 12″-17″. Hi, could you please explain more how to do the bag. Thank you for the lovely pattern. But when I reached the bag I got stuck: in the second row it says: dc in the next 24 sts, 5 dc in one st, dc in next 24 st crochet around with sl st in the place of joining withthe first dc crochet 2 chain. Could you please explain the whole thing again. Could you crochet the bag? I struggle in understanding the pattern of the bag – the 2nd row?? Hi can you tell me how you stitch the hair tresses to the head. In Rnd 8 on the vest: If you do 6 dc, inc and then repeat 6 times, you would come up with 48 stitches and not 42. (See Rnd 41 on the body). Could you please explain? Thanks! Hello, trying to make Molly doll but finding it difficult where to join the legs. Can you help please? How big is the finished doll? 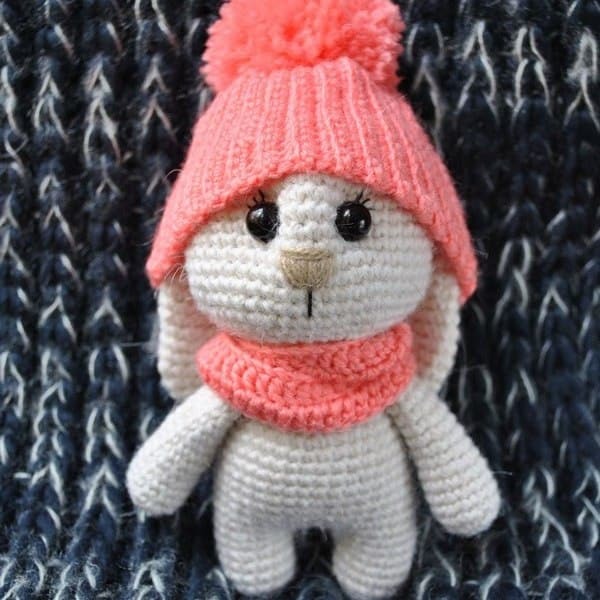 Thanks so much for this pattern, I just finished making Molly… I love how she turned out.. I used 8ply wool. Hi. I confused about bag.. How to do sl st across the sides at wrong side? Than how I will turn wrong side in? beautiful pattern ..pls help how to make it self standing ? You can insert hard insoles inside the shoes and add poly pellets to stabilize the doll weight. hi, thanks for this pattern , but I want to know the weight of the yarn balls please . What is a “half single stitch”? Referring to the shoe round 5 in front loop only done in white? Why do you insert cardboard soles into the feet? Do you need to use it? Hi Lisa 🙂 It’s optional. Thanks. Just wondering what the benefit is of putting it in. I’ve just finished Molly and she’s so sweet , no trouble what so ever with pattern she ia just like the picture! But I don’t see the Bag pattern working with just 4 rounds. What am I missing with the bag pattern. Thanks for pattern. Linda demais!!! gostaria em pdf. Como faço para receber? Wanted say thank you for this lovely pattern…i have made her twice now with different hair..the last doll i made i entered her into our county fair this weekend and she took 1st place ribbon…she is adored by all. Kudos to the designer!!.. Beautiful! Thanks for sharing.God bless you dear.I will surely make one for me. Thanks for sharing. Beautiful pattern.I will surely try and make one.God bless you dear. Thank you so much for this lovely pattern. Could not find the right hair, so I cut lengths of brown double knitting wool and unravelled this. She has a full head of slightly frizzy hair. She looks great. How tall in inches is Molly? It’s about 10.6 inches tall if you use the specified yarn and hook. Good evening. 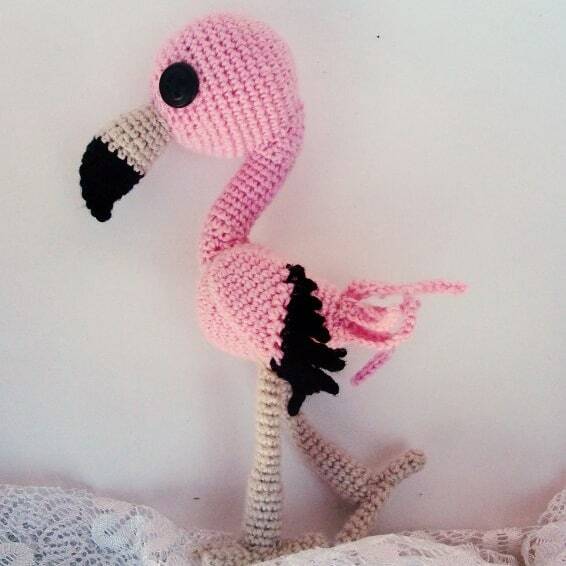 I’m a self taught knitter/crocheter and normally make animals and booties etc. for my grandchildren. However when my wife saw Molly she had to have it! It is a very well written and easy to follow pattern and was my first advanced pattern i tackled. She turned out great but shes BALD. I can’t figure out how to attach the hair. I’ve made crocheted hair before but the wife wants the real-look hair and i’m stumped. If you could help me I would very much appreciate it. Hello. What does lifting ch mean? Hi Dimitra, it is the same as turning ch, a simple ch needed for lifting. 3/4 of the way though. Loving it! Has molly got a sister? Maybe one with different pattern top and hat and bag? Please help me to get started on the legs/body. I’m doing ch10 and form a ring. Then 2 lifting chains. Then i do the 4 dc in third ch, then 8 dc in next 8 ch. Then 5 dc in last ch. Getting this wonky circle…. then don’t know how to turn and continue after ch….. help! Hi Karien, please do not make a circle at the first step. You crochet a straight chain (not a circle), then crochet along the chain at both sides in spiral like baby shoes. Is that a 5 ply? With no specific measurements for the various parts, I’m not sure what to get! What length did your shoe end up? I used a 4 ply as a trial with a 2 hook and it is 7.5 cms! Hope you can help with this? Hi again, I found a ball of thinner cotton to try a head with and the circumference is 9 inches! Is this anywhere near right? I’m not sure whether to get the 4 or 5ply, and should it be wool or cotton? Hope you can help again! 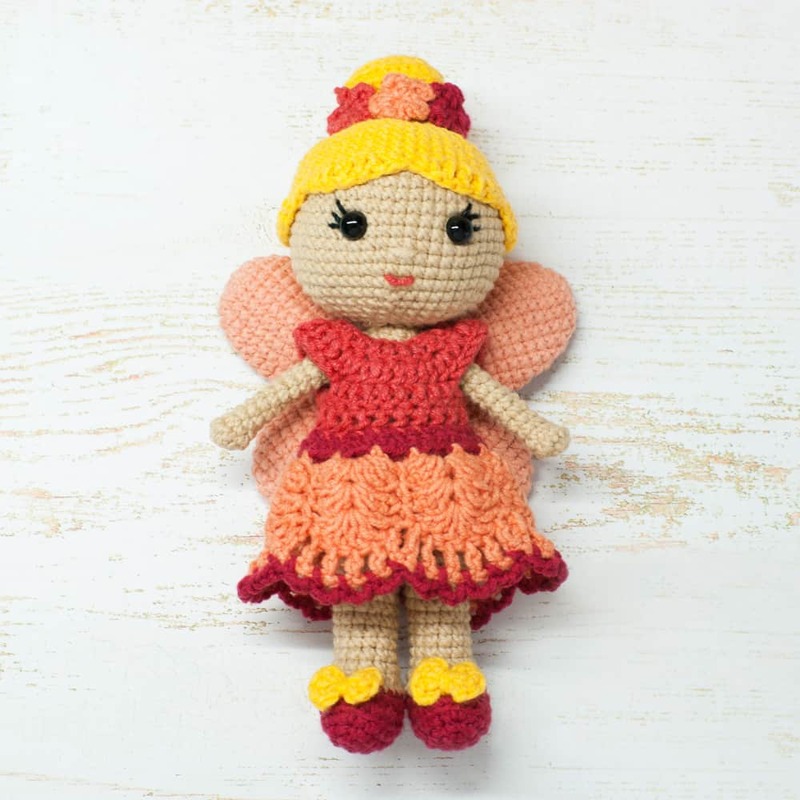 It’s better to use semi-cotton yarn for this doll that is suitable for 2-2.5 mm hook. I do have a lot of 8 ply wool and have done a head using a 2mm hook, it looks quite large as I’m not sure of the measurements for the head! Any help would be much appreciated!! Thanks, I now have an excuse to go online shopping! I need more wool!!! I’m a little confused about the pattern. When creating the head where it says repeat 6 times; do I do that stitch for 6 entire rounds or just do the stitch 6 times for that round? Hi Mia 🙂 Please repeat the space given in brackets the specified number of times. You can see the total number of stitches in square brackets. Many thanks for this pattern. It’s so cute. I’m really happy to finalize this doll. Do you have some requirement in order to post or Sell a work made with this pattern? I just wanted to point out an irregularity that has been causing some problems with some fellow crocheters. For the white detail row on the shoes it was written with the UK term half single crochet while the rest of the pattern and the abbreviation list is written is US terms. This should instead be a slip stitch. Same stitch technique but different terminology. 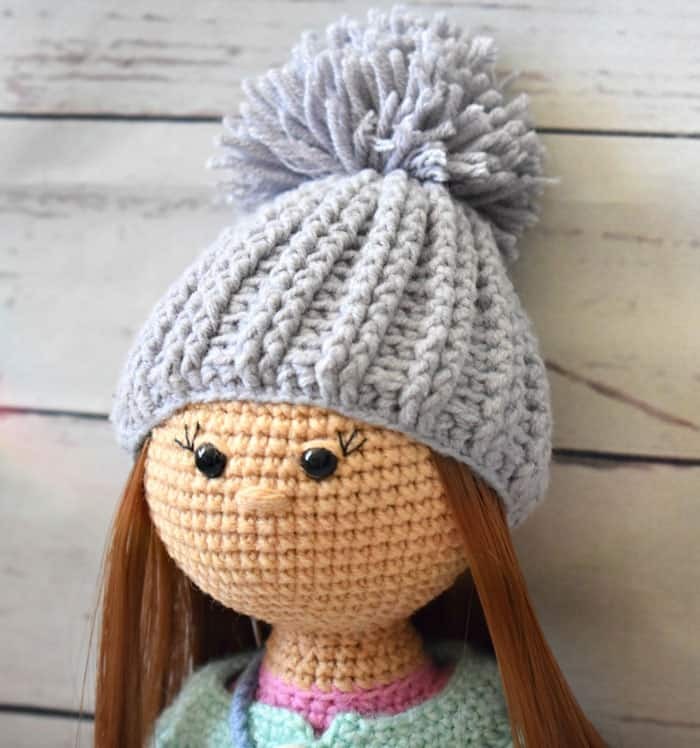 Hi I’ve just finished this doll and would like to say thanks for sharing this pattern . I’m self taught and only been crocheting a few weeks. I found your pattern very well written and easy to follow. I started making bits and bobs to sell towards my grand daughters go fund me as she has leukaemia . Would you mind if I did this with doll? What a fantastic website and lovely positive support and comments I’m just learning new stitches and want to try the pattern 😀 But not sure if I am brave enough. I don’t seem to be able to print the pattern. This is on a Free site, but it looks like you have to buy he pattern to be able to print it. Is this. Orrect? This is adorable!! Could you please tell me how tall the doll ends up being after completion? Thank you!! Hi Amanda, if you use the recommended materials your doll will be about 30 cm tall. But note that in case you use thicker yarn and bigger hook your doll will be larger. just crochet in skin tone yarn from shoe to top and omit the row of crocheting into back loops..l was thinking of doing this too so that l could make dresses instead.. Thank you so much for sharing your patterns for free too. 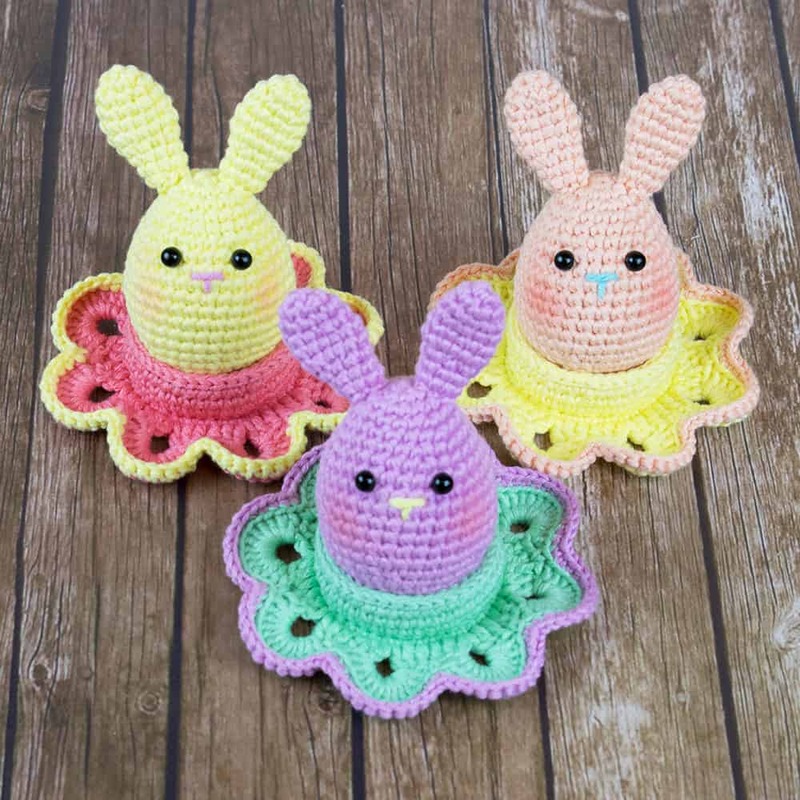 But I know how much it takes to create a pattern that works out easy, so I have decided to buy this one and the little bunny family pattern too. We should support each other. I will be definitely buying more from you. I also didn`t know where to ask you, but are we allowed to sell the finished products and link to your shop? Can she be washed in washer. Hi Angela, it depends on the yarn type and stuffing you used. Love this pattern I just have one question,please can you tell me how you sew the head on and how to you stop it from falling over or dropping down?Am I not doing something right HELP!! Hi Donna, what do you use as stuffing? I’m using Classic Fiber Fill,I purchased this from Micheals. Hi Donna, please try to stuff the head not very firmly. Also you can insert a wooden stick in the neck (one end of the stick is inside the body, another one is inside the head). This will support the head very well. Thank you I will try this on the next Molly Doll I make,I enjoyed making not one but two,for a friend one was for her granddaughter who turns Sweet 16,and the other for herself. Hi could you please help me on the making of the shoe, I have made it twice then taken it apart. I’m confused on Rnd 9 to Rnd 13. Rnd 9 do I sc 24st, then Decrease 4 X in a row? Or do I sc 24 st then decrease by 2 and repeat sc24st, decrease by 2? Hope this makes sense. I have tried both ways but when I decrease 2sc 4x in a row the pattern of the shoe starts to show a big gap. Hi Karen, hope this explanation will help you: Rnd 9: 24 sc (one sc in each st); then 4 decreases (= 2 st together + 2 st together + 2 st together + 2 st together); 14 sc (one sc in each st). did you discover a problem with round 14..?? l think that was a miss print and should have read ’12’ instead of ‘2’.. Impossible for me to download this template or print it. I have done row 7 of the vest so many times that I give up. Please dumb it down for me. I do not get how you end up with 36 stitches. I really want to finish the vest the doll just isn’t complete with out it. In Rnd 7 you’re making arm-holes. So, you should crochet dc in next 8 st, then crochet 9th and 22nd together skipping the stitches from 10th till 21st. Thus you will get the first arm-hole. Make the second arm-hole in the same way following the rest of Rnd 7 instructions. Could you please help me with row seven of the vest? I don’t understand it. Thank you. I don’t understand RD-7 of the vest. How do you crochet 9 and 22 stiches together , and 41 and 54 stitches together ? Crochet them together as you usually do a decrease. Thank you,not only do I have Grandchildren and great grandchildren, I have a yellow Labrador service dog and a African Grey Parrot who both adore dolls and animals to play with! Thank you for sharing! cindy, Cmt.eatonscards59. Beautiful pattern.Thanks for sharing. Enjoyed making the doll. Where can I purchase the hair tresses? Hi Diane, please try to find it in beauty supply store or handcraft shop. I’ve crochet for years and havent heard of a magic ring. Could you please let me know what it is? Thanks for sharing the pattern. 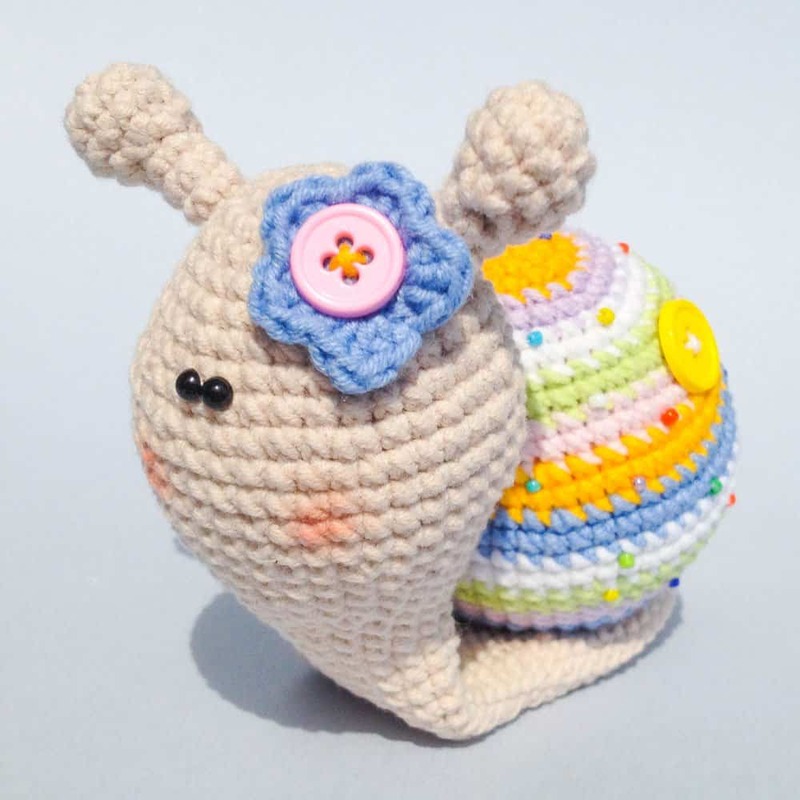 Hi Shellie, here is a tutorial https://www.youtube.com/watch?v=gEq48ABHRZo Instead of magic ring you can make 2 ch and start crocheting sc in the second ch from the hook like in the magic ring. Beautiful pattern! I’m going to try but what is a lift stitch? Thanks for sharing. I wonder if I should work in continuous round if no sl st is mentioned, e.g. the head, body, arms, etc.. Thanks. Love it have not done any thing like this but would like to try some how! Would love to make it. Thanks for sharing.